Well, technically, I'm done. I finished painting over the weekend and added just a few hand-painted windows. But for now, I'm showing off some pics of the progress right before the finish line. Firstly, here's a pic of the primed model with some more styrene rectangles added to cover the cracks and splits. Then, I routered out some road wheels from an AMX-13/90 to create new engine rings. Not only did these cover the broken ends, but they really helped the overall look. 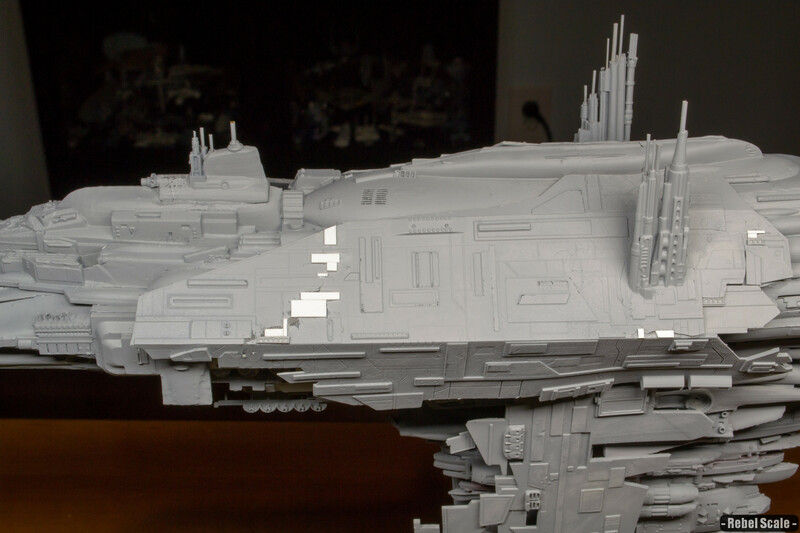 Finally, I have a few in-progress shots of the forward hull. 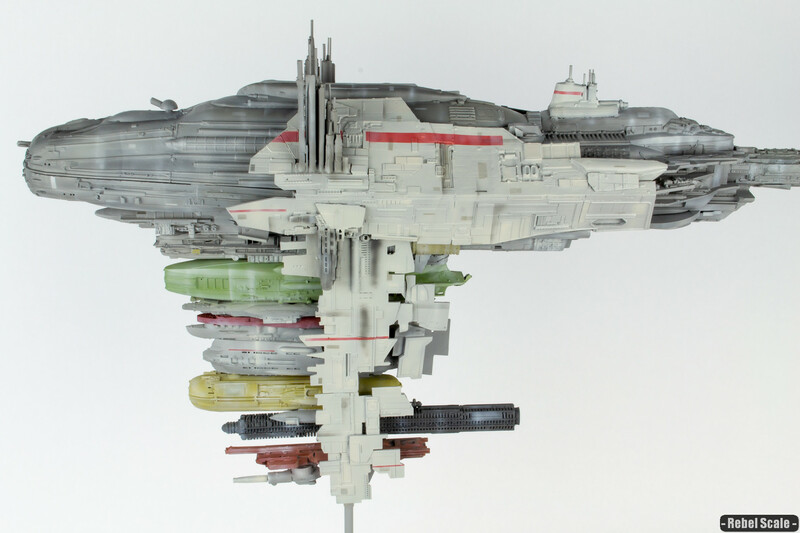 You can see all of the modulating colors that I used, mostly MRP lacquer paints and a few Tamiya paints. The trick here is having a few index cards with sections or little rectangles cut out. Then, I can simply place the index cards on the model, lightly spray, and you get some neat effects. One other trick is spraying along the edge of an index card (or tape), which creates a subtle streak. 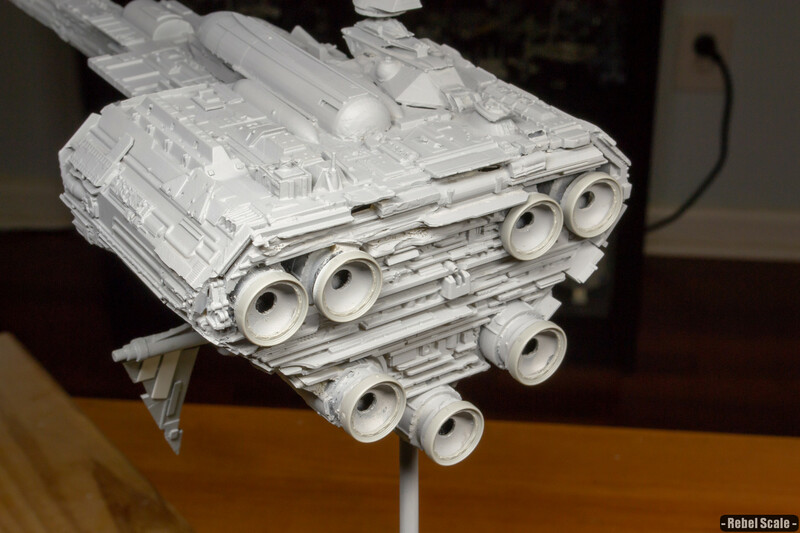 ILM used this trick with a lot of their models. It may seem fast and dirty, but it looks effective if you are careful when airbrushing. However, I did use tape for the red lines to make them sharp. After, I sprayed some light grey over the red markings to soften them. Note, the contrast went way up for those pics, so the colors are much more muted on the real thing. 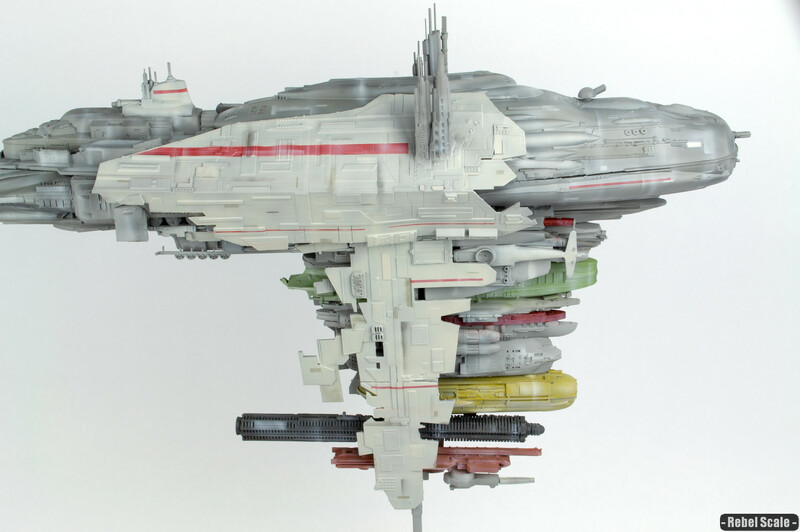 Posted in Star Wars models and tagged nebulon frigate, plastic model, scale modeling, Star Wars. Good job J! I imagine its really rewarding when you finally finish something that has given you so much trouble. It made me realize I never really looked that closely at the frigate. I can only recall getting this as a micro machine…has it ever been made into a die cast vehicle, model, or otherwise aside from micro machines?? Oh and I was wondering, although your database is already very extensive and well constructed, Is there any way to have a section where you click on a given ship and it will retrieve and display any and all entries that you have gathered across the different lines? Thanks man. There is a Titanium version, Fantasy Flight Armada version, Wizards of the Coast version, and one from De Agostini which I don’t have. Both the Titanium and De Agostini are die-cast. Unfortunately, the way the tables work. I would have to create tables for each vehicle for that to work. I wish I knew a way to make a single interactive table like that, but I don’t have those skills yet. Best I can say is go to each scale page and arrange it by vehicle name. Best!